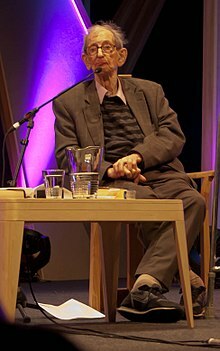 Eric John Ernest Hobsbawm, CH (9 June 1917 – 1 October 2012) was a British Marxist historian and author, once the leading theorist of the defunct Communist Party of Great Britain, and former president of Birkbeck College, University of London. Primitive Rebels: Studies in Archaic Forms of Social Movement in the 19th and 20th Centuries (1971), p. 60. Bandits (Penguin, 1985), p. 25. Liberalism was failing. If I'd been German and not a Jew, I could see I might have become a Nazi, a German nationalist. I could see how they'd become passionate about saving the nation. It was a time when you didn't believe there was a future unless the world was fundamentally transformed. Divided Europeans: Understanding Ethnicities in Conflict (1999), p. 41. Look at London. Of course it matters to all of us that London's economy flourishes. But the test of the enormous wealth generated in patches of the capital is not that it contributed 20%-30% to Britain's GDP but how it affects the lives of the millions who live and work there. What kind of lives are available to them? Can they afford to live there? If they can't, it is not compensation that London is also a paradise for the ultra-rich. Can they get decently paid jobs or jobs at all? If they can't, don't brag about all those Michelin-starred restaurants and their self-dramatising chefs. Or schooling for children? Inadequate schools are not offset by the fact that London universities could field a football team of Nobel prize winners. Mapping the Nation (Mappings Series) (13 November 2012), p. 263. Though the web of history cannot be unraveled into separate threads without destroying it, a certain amount of subdivion of the subject is, for practical purposes, essential. Words are witnesses which often speak louder than documents. Let us consider a few English words, which were invented or gained their modern meanings, substantially in the period of sixty years with which this volume deals. They are such words as 'industry', 'industrialist', 'factory,' middle class,' 'working class,' and 'socialism.' They include 'aristocracy,' as well as 'railway,' 'liberal' and 'conservative' as political terms, 'nationality,'scientist,' and 'engineer,' 'proletariat,' and (economic) 'crisis'. In terms of political geography, The French Revolution ended the European Middle Ages. The really frightening risk of war was neglect, filth, poor organization, defective medical services, and hygenic ignorance, which conditions (as in the troops) practically everybody. Rarely has the incapacity of governments to hold up the course of history been more conclusively demonstrated than in the generation after 1815. To prevent a second French Revolution, or the even worse catastrophe of a general European revolution on the French model, was the supreme object of all the powers which had just spent more than twenty years in defeating the first; even of the British, who were not in sympathy with the reactionary absolutism which re-established themselves all over Europe and knew quite well that reforms neither could nor ought to be avoided, but who feared a new Franco-Jacobin expansion more than any other international contingency. And yet, never in European history and rarely anywhere else has revolutionarism been so endemic, so general, so likely to spread by spontaneous contagion as well as by deliberate propaganda. no groups of populations welcomed the opening of the career of talent to whatever kind more passionately than those minorities who had hitherto been disbarred not merely because they were not well-born, but because they suffered official and collective discrimination. The progress of science is not a simple linear advance, each stage marking the solution of posing of problems previously implicit or explicit in it, and in turn posing new problems. In 1831 Victor Hugo had written that he already heard 'the full sound of revolution, still deep down in the earth, pushing out under the kingdom in Europe to its subterranean galleries from the central shaft of the mine which is Paris. 1847 the sound was loud and close. In 1848 the explosion burst. People may not like to meet bandits, especially on a dark night, but a taste for reading about them seems to be universal. The point about social bandits is that they are peasant outlaws whom the lord and state regard as criminals, but who remain within peasant society, and are considered by their people as heroes, as champions, avengers, fighters for justice, perhaps even leaders of liberation, and in any case as men to be admired, helped and supported. Banditry is freedom, but in a peasant society few can be free. most are shackled by double chains of lordship and labour, one reinforcing the other. For what makes peasants the victim of authority is not as much their economic vulnerability - indeed they are as often as not virtually self sufficient - as their mobility. Eric Hobsbawm (1992). Nations and nationalism since 1780 programme, myth, reality. Cambridge, UK: Cambridge University Press. pp. 76–77. ISBN 0-521-43961-2. Nations and Nationalism since 1780: Programme, Myth, Reality (Cambridge University Press, 2nd ed. 2012), p. 12. Nevertheless it is evident — if only from the Greek example just cited — that proto-nationalism, where it existed, made the task of nationalism easier, however great the differences between the two, insofar as existing symbols and sentiments of proto-national community could he mobilized behind a modern cause or a modern state. But this is far from saying that the two were the same, or even that one must logically or inevitably lead into the other. For it is evident that proto-nationalism alone is clearly not enough to form nationalities, nations, let alone states. My object is to understand ad explain why things turned out the way they did, and how they hang together. For anyone of my age-group who has lived through all or most of the Short Twentieth Century this is inevitably also a autobiographical endeavor. We are talking about, amplifying (and correcting) our own memories. And we are talking as men and women of a particular time and place, involved, in various ways,in its history as actors in its dramas - however insignificant our parts - as observers of our times and, not least, as people whose views of the century have been formed by what we have come to see as its crucial events. The destruction of the past, or rather of the social mechanisms that link one's contemporary experience to that of ealier generations, is one of the most characteristic and eerie phenomena of the late twentieth century. The world that went to pieces at the end of the 1980's was the world shaped by the impact of the Russian Revolution of 1917. In the simplest terms the question who or what caused the Second World War can be answered in two words: Adolf Hitler. Why brilliant fashion-designers, a notoriously non-analytic breed,sometimes succeed in anticipating the shape of things to come better than professional predictors, is one of the most obscure questions in history; and, for the historian of culture, one of the most central. The best approach to this cultural revolution is therefore through family and household, i.e. through the structure of relations between the secondhand generations. In most societies this had been impressively resistant to sudden change, though this does not mean that such structures were static. The cultural revolution of the later twentieth century can thus best be understood as the triumph of the individual over society, or rather, the breaking of the threads which in the past had woven human beings into social textures. For such textures had consisted not only of the actual relations between human beings and their forms of organization but also of the general models of such relations and the texted patterns of people's behaviour towards each other; their roles were prescribed, though not always written. Hence the often traumatic insecurity when older conventions of behaviour were either overturned or lost their rationale, or the incomprehension between those who felt this loss and those too young to have known anything but anomic society. The old moral vocabulary of rights and duties, mutual obligations, sin and virtue, sacrifice, conscience, rewards, and penalties, could no longer be translated into the new language of desired gratification. Once such practices and institutions were no longer accepted as part of a way of ordering society that linked people to each other and ensured social cooperation and reproduction, most of their capacity to structure human social life vanished. They were reduced simply expressions of individuals' preferences, and claims that the law should recognize the supremacy of these preferences. Uncertainty and unpredictability impended. Compass needles no longer had a North, maps became useless. The tragedy of the October revolution was precisely that it could only produce its kind of ruthless, brutal, command socialism. As I think back, I ask myself, again and again: was there an alternative to the indiscriminate , brutal, basically unplanned rush forward of the Five-Year Plan? I wish I could say there was, but I cannot. I cannot find a answer. The greatest cruelties of our century have been the impersonal cruelties of remote decision, of system and routine, especially when they could be justified as regrettable operational necessity. Surrealism was a genuine addition to the repertoire of avant-garde arts, its novelty attested by the ability to produce shock, incomprehension, or what amounted to the same thing, a sometimes, embarrassed laughter, even among the older avant-garde. It was the tragedy of modernist artists, Left or Right, that the much more effective political commitment of their own mass movements and politicians - not to mention their adversaries - rejected them. With the partial exception of Futurist-influenced Italian fascism, the new authoritarian regimes of both Right and Left preferred old-fashioned and gigantic monumental buildings and vistas in architecture, inspirational representations in both painting and sculpture, elaborate performances of the classics on stage, and ideological acceptability in literature. Nothing is easier than to see the Christ of the Sermon on the Mount as 'the first socialist' or communist, and though the majority of early socialist theorists were not Christians, many later members of socialists movements have found this reflection useful. Unlike the word 'communist', which always signified a programme, the word 'socialist' was primarily analytical and critical. Marx's ideas became the doctrines inspiring the labour and socialist movements of most of Europe. Mainly via Lenin and the Russian Revolution they became the quintessential international doctrine of twentieth-century social revolution, equally welcomes as such from China to Peru. Through the triumph of parties identified with these doctrines, versions of these ideas became the official ideology of the states in which, at their peak, something like a third of the human race lived, not to mention political movements of varying size an importance in the rest of the world. The only individually identifiable thinkers who have achieved comparable status are the founders of the great religions in the past, and with the possible exception of Muhammad none have triumphed on a comparable scale with such rapidity. No secular thinker can be named beside him in this respect. The chief problem for all of Hobsbawm’s history was that his primary aim was to verify the theories of Karl Marx. Despite claims by his obituary writers that he was never a slave to Marxist doctrine, or that his work was “always nuanced” and “elegant”, the opposite was true. Presented as a pendant to Age of Extremes, a personal portrait hung opposite the historical landscape, what light does Interesting Times throw on Hobsbawm’s vision of the twentieth century, and overall narrative of modernity? In overarching conception, The Age of Revolution, The Age of Capital, The Age of Empire and Age of Extremes can be regarded as single enterprise – a tetralogy which has no equal as a systematic account of how the contemporary world was made. All display the same astonishing fusion of gifts: economy of synthesis; vividness of detail; global scope, yet acute sense of regional difference; polymathic fluency, at ease with crops and stock markets, nations and classes, statesmen and peasants, sciences and arts; breadth of sympathies for disparate social agents; power of analytic narrative; and not least a style of remarkable clarity and energy, whose signature is the sudden bolt of metaphoric electricity across the even surface of cool, pungent argument.